This small island, 6km in length, is situated off Padre Burgos on the most southerly tip of Leyte. It has become noted now for its pristine coral reefs and there are a number of sites worth visiting. Large pelagic life abounds here and you can expect to come across barracuda, mackerel, tuna and jacks. To the north is Max Climax wall which is reachable from the beach at Lungsodaan, Padre Burgos. The wall itself is dotted with crevices that are home to a multitude of fish life including snapper, grouper, sweetlips and many smaller tropical fish. Nearby Turtle Rock, at depths of between 20-35m, will give you the opportunity to see a myriad of smaller fish and as the name suggests, turtles. Larger fish can be encountered, including sharks, barracuda and rays. To the south of Max Climax is Tangkaan Point. 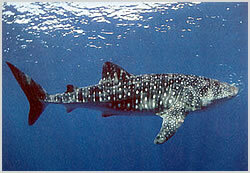 It is here that the chances of seeing a whale shark are highest, between November and May. Other fish life regularly spotted are mantas and whitetip and blacktip sharks. Reef life is varied, especially around Barrel Sponge Garden. There are large table corals here, as well as gorgonians, whips and soft corals in the vicinity.